BB-3 has been classified as a deep depression, seeing the pressure deficient and estimated 3 minute winds.BB-3, stationary as mentioned, is now having estimated core pressure of 994 mb and estimated core winds of 30 knts. Positioned at 21N and 90.5E.Though International model has informed of formation of Tropical Cyclone, there is no clear cyclonic structure seen. Thick convective cloud bands are visible in South, South West and South East Quadrants (due to warm moist air from Bay SST of 31c). 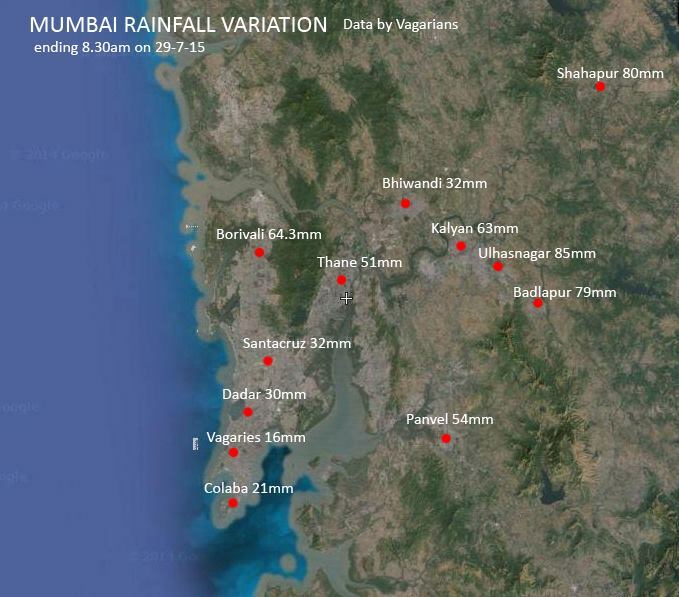 Mumbai received 32 mms at Scruz and 21 mms at Colaba in last 24 hrs ended Wednesday morning. Badlapur, Dadar and Borivali are private readings from Abhijit, Salil and Tejas. 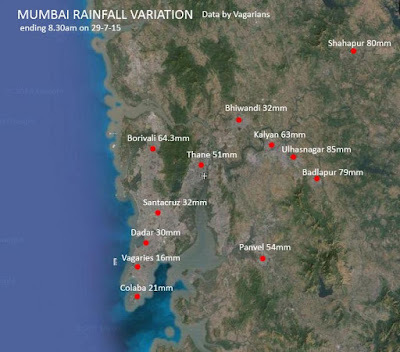 Mumbai received 28 mms (Scruz ) and 23 mms (Colaba) on Monday and 27 mms (Scruz) and 19 mms (Colaba) on Tuesday.Averaging around the 20-25 mms estimated. Wednesday and Thursday will be similar, partly sunny and with some passing showers, may bring around 20-25 mms per day. As on Tuesday Night, The depression in Rajasthan was at the International Border, near SE Rajasthan and at 995 mb strength. The isobar bands were spiralled closely, and hence created very strong gusty winds in South Rajasthan, Gujarat and North Konkan. System will weaken in the next 12-18 hrs from this posting, and a decrease in rains in Rajasthan, Saurashtra and Gujarat from Wednesday. Rains decreasing considerably in Sindh. (As mentioned earlier). VADGAM 180, Bodeli 171, MAHESANA 159, BECHARAJI 157,VAPI 114. AMIRGADH 150, ,DANGS (AHWA) 142,GANDHINAGAR 105,QUANT 140,VANSDA 136. KANDLA AIRPORT 190, KANDLA NEW 170,BHACHAU 146,GANDHIDHAM 142, Lakhpat 123.
and Ahmedabad saw another 54 mms on Tuesday. Bhuj now has a seasonal total rainfall of 520 mms (All in last 2 days)...against a annual normal of 360 mms !Nakhatrana, with a total of 433 mms, has crossed its normal annual rainfall of 390 mms. Bharuch total rain as of today is 353 mms. The Bay System, BB-3, remains stationary, and shows clear cut bands in the South as it strengthens. As expected, it will start its track from Thursday30th. After an impatient wait, I do not see much scope from BB-3. RAJ Mt.Abu gets new companion - MAHA Mahabaleshwar - day1 450 mm , day2 350 mm !!!! According to the state government release, 187 talukas recorded notable rainfall since yesterday. In Banaskantha district of North Gujarat, Lakhani received 530 mm rainfall, Suigam 480 mm, Dhanera 435 mm, Vav 416 mm, and Bhabhar 350 mm. Two other districts -- Patan and Kutch -- also reported heavy downpour since yesterday, it said. Bhachau (301 mm), Anjar (234 mm) and Rapar (233 mm) of Kutch received good rain fall today, it said. In Patan district in North Gujarat, Patan taluka registered 206 mm and Sarasvati taluka recorded 206 mm rain fall today, said the release. Ahmedabad city recieved 138.45 mm of rainfall. It seems BB3 will bring rains to same area that got recent heavy rains. West MP, Raj, Kutch regions. No rains again in Telangana, NI Karnataka, Marathwada. When these areas will get rains ? Dams too in this area not filling up in this season due to missing heavy rains from westhern ghats. Gujarati paper mumbai samachar reports lake areas in Mumbai getting good rainfall and has accumulated storage of 46% total capacity. Today,s edition last page 12. Sir,Not seen much scope from BB-3 means? Dattaraj: BB-3 actually may not be very useful to India. Thats what i mean when i write "not much scope" (Gaurav: your query). But, as BB-3 moves North, in a few days, it will weaken. 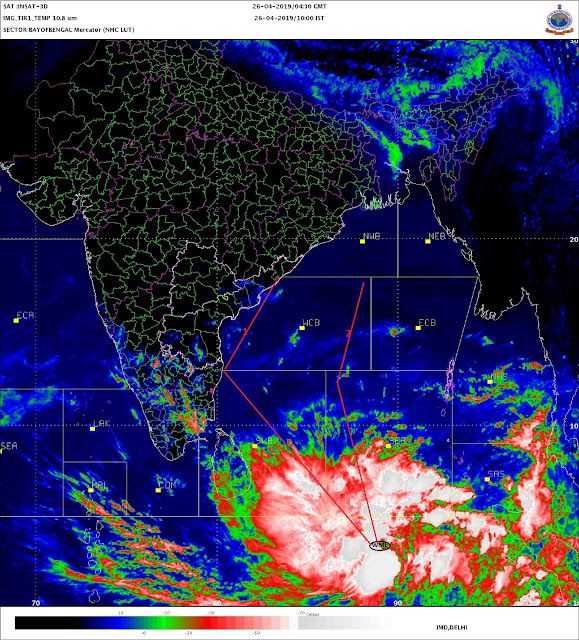 I estimate another embedded Low in the axis somewhere in Central India. I do not commit now, as it will depend on axis position and BB-3 . rajesh sir what is next for sindh region? As of Wednesday morning, EDT, Tropical Cyclone 02B is located approximately 85 miles south-southwest of Chittagong, Bangladesh. Tropical Cyclone 02B is moving north-northeastward at 3 mph. Maximum sustained winds are 40 mph with gusts to 50 mph. Tropical Cyclone 02B is forecast to move northward and slightly strengthen over the next 24 hours making landfall in southeastern Bangladesh on Thursday before turning westward. This system is expected to bring flooding rain to southern Bangladesh Thursday and then northeastern India Friday into Saturday. By AccuWeather.com Meteorologist John Schneider"
Still no good rain in almost karachi. Total rains till date 40mm. Only gulshan e hadid area which is edge of karachi got good rains. My guess is tropical cyclone rain quantum cannot match with GUJ / RAJ cyclonic circulations... figures ranged from 700 mm - 200 mm widespread and span multiple days!!!! Wondering why this is not present in BBC weather. abizer: Ok..will put up on Thursday.Forecast for Konkan. Majid: Yes, I also mentioned "some International odel" has said Cyclone. Muhammad Faisal: This was estimated for Karchi in vagaries: " Frequent rains on Monday should measure around 20 mms (avg), and again another 12-15 mms on Tuesday." Nice update link provided by srivathsa on reservoirs levels in Maharashtra including mumbai.